This was only the sixth “peace full home” post I wrote, when I published it back in November of 2013. There are now over two-hundred stories, and I love to “look back to look forward”. Often, when I reread an old post, I recognize the true circle of life, and how truly blessed we are. Depending on where you live “thankful” is not only expressed differently, it’s felt differently. Many of us have the privilege of being thankful for people who love us, good health, a career (or retirement), or a roof over our heads. Many, many others are thankful for just one day of non-violence, shelter from the cold (or heat), or a medical facility even remotely close to them, someone to give them anything to eat. It seems that in this fast-paced life we create we don’t truly stop, and breathe, and reflect, long enough to be thankful. We often have great intentions because we know how fortunate we are but— in spite of that—this is the time of year many of us go into overdrive attempting to create “perfection”. “Perfect” looks different to all of us but there seems to be some commonalities. We clean, worry, stay up late making lists, cook, bake, overspend, and try to impress—without it looking like it was any effort at all. We’re more concerned with getting to the store for that special sale than we are with staying at the table, talking to someone we love. We try to make up for all the disappointments we’ve had over the years—the times our holidays didn’t look like a bucolic scene from “Currier & Ives”. The funny thing is we often miss the point. Like many people, Larry and I have the list—the “what needs to get done before the holidays arrive” list. There is, however, lodged in my brain what my husband calls the “stealth list”. That’s the list of all the possible things I would like to do before the holidays get here, if only I could make the time. hmmmmm…….. In Dietrich Bonhoeffer’s book “Life Together” he writes, “We pray for the big things and forget to give thanks for the ordinary, small (and yet really not small) gifts.” I think the ordinary but not small gifts are what make up our lives. A lot of us pray when we’re in a tough place, but forget to pray with thankfulness and gratitude for all we have everyday. Over the years, I’ve been encouraged to keep a gratitude journal. I’ve done it from time-to-time but never with real commitment. What’s weird is that it should be one of the easiest things for me (especially as a writer) to do. I have so much to write in that journal. I have a wonderful “family” (I’m not just talking about people biologically or legally connected to me). I have a strong connection to God, and a faith community that honors my spirit. I have a husband who loves me and believes in me. I have wonderful daughters who I talk to every day. I have grandchildren who are amazing and add so much to my life. I have dear friends—friends I have known for 50 years and friends I have known for two years; friends who are real with me; friends who “get” me; friends who hold me accountable; friends who will cry in front of me and who let me cry with them; friends who would drop everything if I need them. I have a home that’s a safe place. I have plenty to eat. I have heat to keep me warm in the winter. I have health. I have abilities. I live in a place with beautiful trees and birds chirping outside my window. I have the luxury of reading and thinking and expressing myself. I have so much. When we look back on our lives I don’t think we’re going to regret spending time with God, in community with other people, or in quiet time connecting with our spirit—the essence of who we are. And, in spite of knowing and writing and teaching that, I have much work to do. I hope that, as this year winds down, we all slow down enough to just be. May this season of love be just that. This entry was posted in Peace Full Home and tagged #Bonhoeffer, #CurrierAndIves, family, friends, gratitude, Thanks, Thanksgiving. Bookmark the permalink. Thank you Betsy. I hope this holiday season is a beautiful one for you! Thank you for your kind words, Rita. Happy Holiday Season! 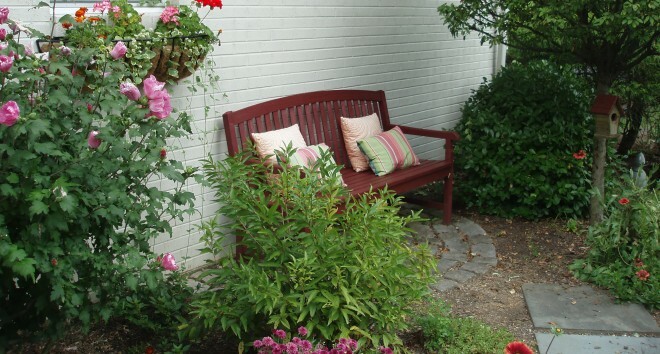 That picture of your bench and gorgeous trees is something to sit and ponder – what beauty!! Thank you for the reminder to be present and not rush through the holiday season – enjoy what is before us. Happy Thanksgiving to you and your family.